We hear you Twin Cities. We hear you western Wisconsin. We hear you all along the great river in the north when you ask; WHERE’S OUR MUSIC FESTIVAL? 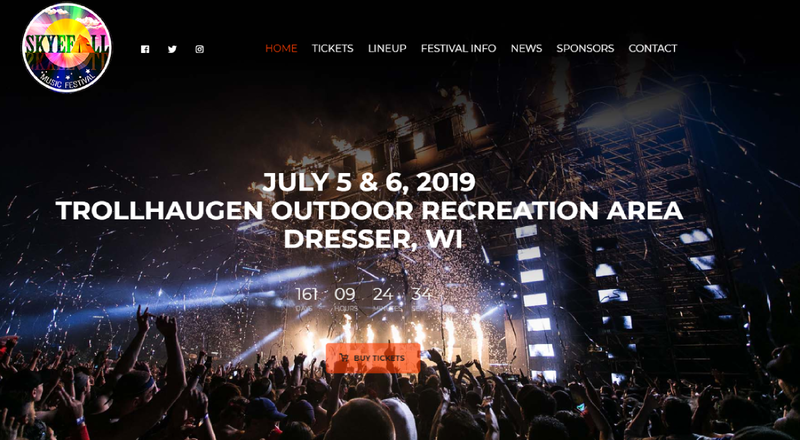 On July 5th and 6th 2019, Skyefall Music Festival will blast your senses with the thunderous boom of some of your favorite musical acts. Skyefall will excite your mind with its plethora of art vendors and it will tame your cravings with its incredible variety of food, drink, and adult beverages. We’ve got your weekend camping handled with over 25 acres of grass covered campsites and yes, you can park your car beside your tent. If you are looking for more luxury within the comforts of your RV or camper, there’s a space for those too. Don’t worry, there’s also onsite parking for those who don’t camp. Skye Companies has been producing events for many years (and attending them for many more) and throughout those years, we began taking note of the important little things, the small details that often get overlooked within the operations of a festival. Producers are always focused on growth and greater production, which are both important, but no more important than the small things that can make or break an event. When you look back and share the memories from your festival experience, was it one of positives or one of negatives? Why will you decide to go back the next year or what made you decide to look for other options on where to spend your hard-earned money. This realization for us at Skye Companies is why we decided to create and begin building our Skyefall Family. We believe that every person deserves the opportunity to attend a music festival at a price that won’t break the bank, and beyond just attending, they deserve an amazing experience. We’ve created an internal team that is solely focused on customer experience.